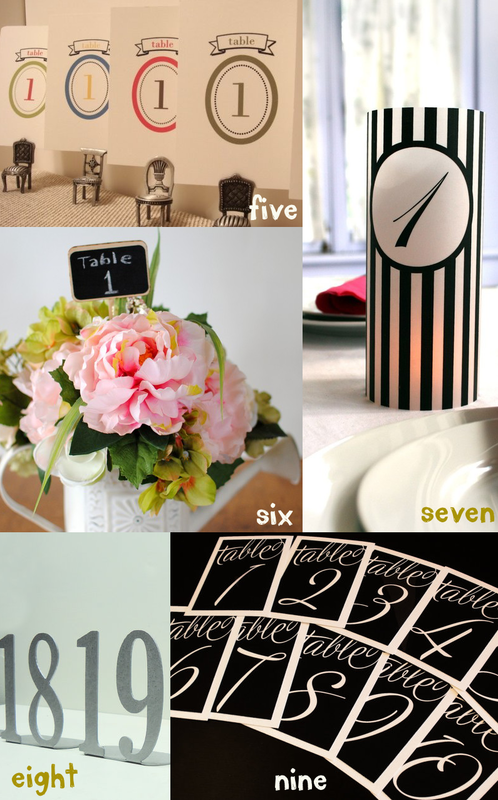 It is true that wedding table numbers help your guests find their seats easily, but did you know table numbers can also add a decorative element to your decor? It’s true! Ditch the drab and transform tired-looking table numbers into works of art with the help of these handmade artisans. We’ve created a round-up of 20 wedding table numbers we love to help inspire you, along with details below each board explaining what we love about each. We hope you enjoy! one – damask never goes out of style! by eltee creative. two – bright + sunny? yes, please! by shine invitations. three – chalkboards + rustic wood design stands can be re-used after the wedding day. by two broads design. four – wine bottles take on an additional function with this table number tied around the top. by rustic blend. five – round table numbers sit in whimsical chairs for a unique look. by wedology. six – we love the entire visual of this one! flowers inside a shabby chic watering can with a chalkboard table number placed in the top. by river road rustics. seven – chic, black and white stripes for a modern look. by the posh event. eight – metal table numbers handmade by knob creek metal arts. nine – this table number features one of the prettiest scripts we’ve ever seen! by jessica lam designs. ten – a reusable chalk board frame as a table number can be reused later! by the funky shack. eleven – this table number offers a fresh, fun ornamental design. by dear emma. 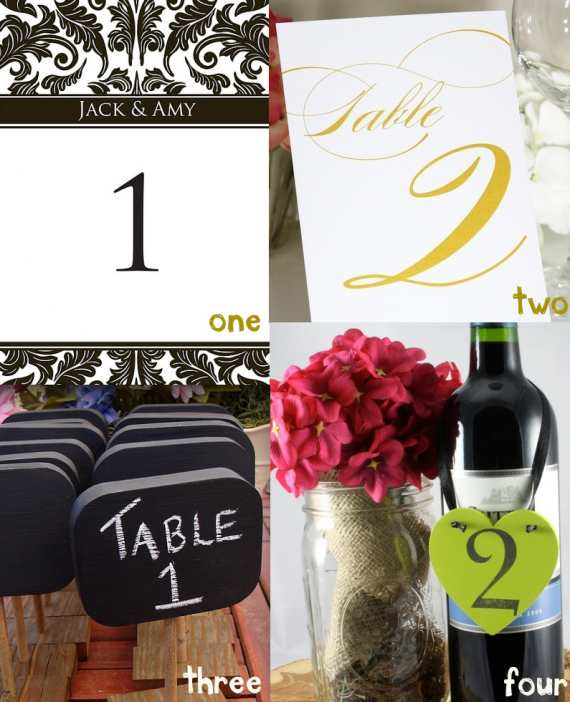 twelve – wedding table numbers on wine glasses? yes, please! by swirly garden. thirteen – table numbers + embroidery hoops = LOVE. by yardley k.
fourteen – these mossy table numbers are perfect for rustic weddings! by white tulip boutique. fifteen – pink, gray, and perfectly pretty. by amare design. sixteen – a wood heart strung through jute and tied around a mason jar = perfection. by rustic blend. 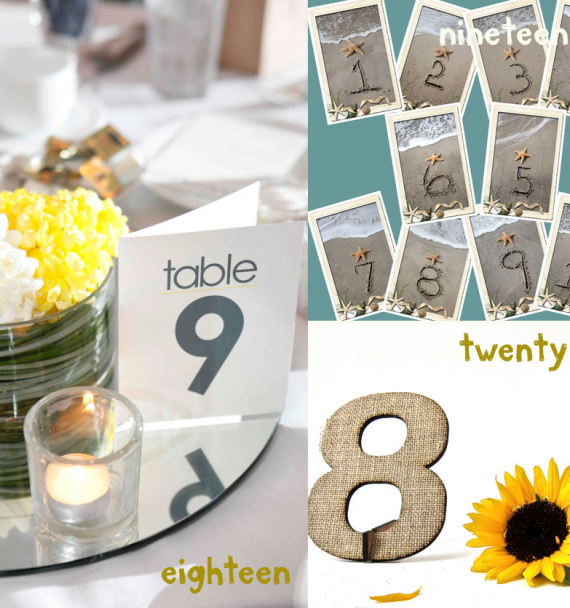 seventeen – feathers as wedding table numbers is a fabulous idea. by lira designe. eighteen – simple folded tent cards to place emphasis on your beautiful centerpiece. by little lady company. nineteen – these wedding table numbers written in sand are perfect for destination weddings. by sandwriting by the sea. twenty – last but certainly not least, this burlap table number is simple and elegant! by better off wed. Which # is your favorite? Tell us below! Looking for more table numbers? Check out The Marketplace! My favorite has to be #13…I love all embroidery details!